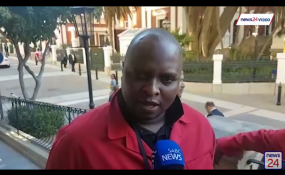 The younger brother of EFF deputy president Floyd Shivambu has denied that he received money from collapsed VBS Mutual Bank and has threatened to go after those who "defamed" him. According to a damning forensic report by advocate Terry Motau and law firm Werksmans Attorneys, Brian Shivambu, owner of Sgameka projects, received R16m. The report, titled "The Great Bank Heist", was published on Wednesday following investigations into the bank. It alleged that looting to the tune of about R2bn had taken place and listed former executives of VBS and its largest shareholder, Vele Investments, as alleged perpetrators. Several officials and leaders in the ANC in Limpopo, including its deputy chairperson Florence Radzilani and treasurer Danny Msiza, were implicated. But the young Shivambu denied the allegations. "Sgameka projects does not have any working relationship with VBS Mutual Bank and has never received any payment from VBS Mutual Bank," he said in a statement on Thursday. He also claimed that his company had been contracted to provide professional consulting services for Vele Investments, for its mining and insurance businesses. He also complained that, although his name was mentioned in the report, none of the investigators had contacted him. "Even though the VBS report mentioned my name, at no stage did the VBS Mutual Bank investigators write to me, interview me or interrogate me to explain my business relationship with Vele Investments," said Shivambu. If they had, he would have demonstrated to them that he had "no dealings with VBS". Shivambu also insisted that he never engaged with any municipalities or any of the bank's potential depositors to encourage them to put money into VBS. According to a Daily Maverick report, R10m of the money he scored from VBS went to his older brother Floyd, while the EFF received R1.3m. The EFF did not say much in response to the allegations. Shivambu said he was aware that his older brother's name had been mentioned, but said his affairs had nothing to do with him. "I am a private businessman and I do not intend to involve myself or my family in political debates."